The DISC personality test or DISC assessment determines your DISC type and personality profile. It is the leading personal assessment tool used by over 1 million people every year to improve work productivity, teamwork, and communication. DISC profiling enables companies to find out about the various personality traits of an individual. Regular DISC profiling keeps you informed about individuals’ performance in their roles. The personality dynamics that are at work in a team can be measured and interpreted using DISC. To customize this template after signing up, choose ‘DISC Assessment Template' as example when creating a new survey. 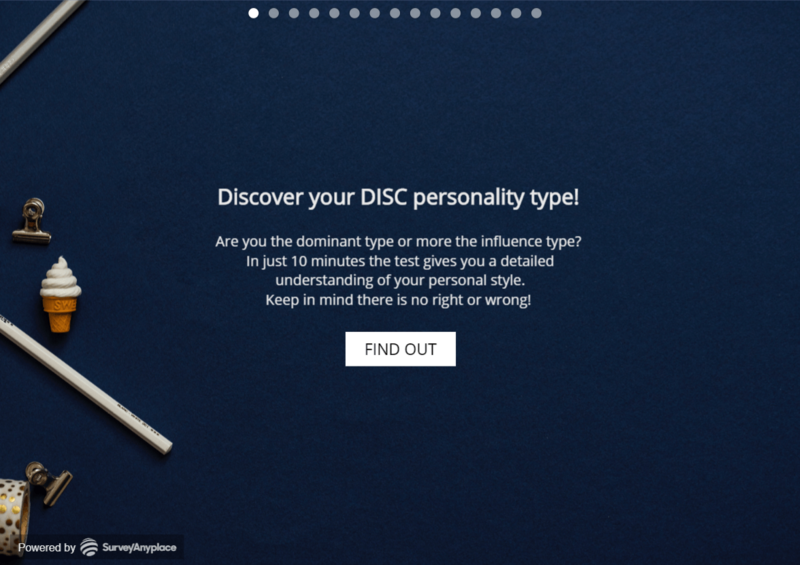 What is DISC & why use a DISC personality test? DISC stands for Dominance, Influence, Steadiness, and Conscientiousness and completing the assessment helps predict your behavior towards others and the everyday things you do. Research shows that behavioral characteristics can be grouped into four personality styles. People with similar styles shows specific behavioral characteristics that are common to that style. The combination of the four personality styles makes a person unique. Don’t forget that there is no right or wrong, everyone has their own strengths, weaknesses, and challenges. None of the profiles are better than the other, every personal style is unique! Dominant types are ambitious and dominant. D-types are focused on results and challenges. They are assertive people who work fast, live fast and make decisions quickly and objectively. D-types have excellent communication skills and are very charismatic, they are often seen as leaders. D’s are motivated by results, actions, and challenges. Influence types are social and enjoy being around people. I- types are cheerful and optimistic. I’s are known to be warm and welcoming, and they are concerned about the feelings of others. Their openness and social awareness are considered charming to those who interact with them.I-types are motivated by recognition, fun, and popularity. Steadiness types are patient and are happy to help others. S-types are gentle and open to new people and new surroundings, though they will need some time to adapt before opening up and showing their truly warm spirit. They are great listeners and motivators. S-types are motivated by appreciation, good relationships, and tranquility. Conscientious types are often seen as the introvert type. They usually prefer to work independently for long periods of focus work rather than multi-tasking. C-types are critical, objective and have a keen eye for detail, procedures, and quality. Usually, they are diplomatic in their dealings and are analytical thinkers. C-types are motivated by quality and perfection. In summary, the disc quadrants can be separated into halves. The dominance and conscientious types are more task-oriented while the influence and steadiness types are more people-oriented. The steadiness and conscientious types are more reserved versus the more active dominance and influence types. Why use Survey Anyplace to create a DISC personality test? Find out straight away if a candidate is suitable and automatically provide them with a useful feedback report regarding needed training and development. The DISC assessment provides a uniform basis for comparing the performance of applicants. The same tests are given to the candidates and their score will enable selectors to see their performance. Remove any mention of Survey Anyplace with our White Label option. Automatically transfer all data to all your favorite tools and apps via Zapier. To make a DISC assessment, sign up for Survey Anyplace , and choose ‘DISC Assessment Template ’ as template when creating a new survey. What are the benefits of the DISC assessment? Summarizing, the test will help you to decide which candidate is most suitable in your company. 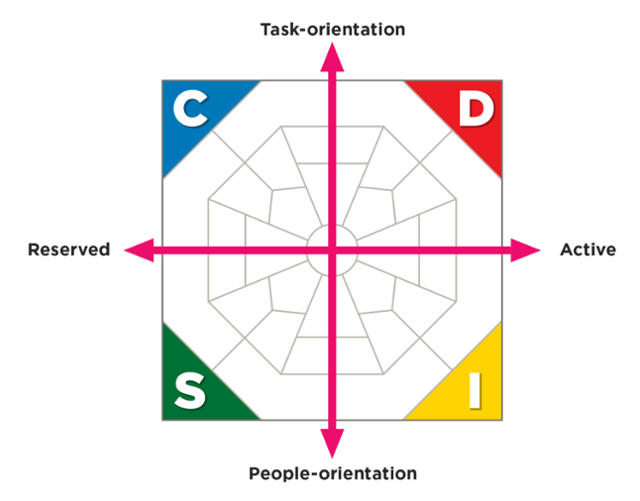 DISC is an essential tool to help build dynamic, successful teams. The team members get insight in themselves but also in the other team members. How do they react under pressure, What is their style of communication? By giving team members insight into their behavior they can work and communicate more effectively with their colleagues. You will learn more about yourself. What are your weaknesses and strengths and how can you improve them? How do you handle stress? What is your ideal role in an organization? How do you respond to a conflict? What motivates you? Aside from a recruitment and HR tool the DISC assessment plays a key role in sales. Every customer has different needs so it’s important to find out which DISC archetype most closely matches you and your prospect. You learn how to listen, speak and sell to customers off all different styles. Looking for more HR survey templates and examples?